Forty years ago, the most intense drama in Italy’s postwar political history reached its climax. On the morning of May 9, 1978 the commandos of the Red Brigades abandoned a stolen Renault 4 on Rome’s via Michelangelo Caetani, not far from the river Tiber. In the trunk was the bullet-riddled body of former prime minister Aldo Moro. Secretary of Italy’s ruling Christian Democratic party (DC), Moro was the highest-profile victim of the political violence that engulfed 1970s Italy. The fifty-five-day crisis in which he was held hostage by the Red Brigades, ending in his murder, also decisively undermined attempts at a pact between the DC and the Italian Communist Party (PCI). The Red Brigades were hostile to the PCI and targeted Moro because he had been one of its leading interlocutors in the ruling party. The DC had been in office continuously since 1944, but faced with parliamentary deadlock after the 1976 election, PCI secretary Enrico Berlinguer pushed a “historic compromise” to unite the two parties in government. The Red Brigades who took Moro hostage sought to prevent a reformist solution to Italy’s institutional impasse. Their actions, or at least the anticommunist blowback it produced, did help block the PCI’s path toward power. But while they thought that this would radicalize the Italian political landscape, they were sorely mistaken. The violence of these years ultimately expressed the decline of the extra-parliamentary left. Following the end of the social struggles that peaked in 1977, hundreds of leftists took to the armed underground. This was a disastrous dead end, a frontal clash with the Italian state that invited repression against even militants distant from this milieu. Four decades later, Italy again faces political deadlock. Moro’s death was the swansong of the postwar “First Republic,” marking the failed reform of the Christian Democratic order. This brought not renewal, but protracted decline and fragmentation. The debris continues to litter the present, in an Italian political system devoid not just of credibility, but of hope. Much different was the Italy of 1945, ruled by a coalition of the DC with the PCI, the Socialists, and other Resistance parties. This alliance broke down in 1947 amid wider Cold War pressures, leaving the DC as the dominant force. The PCI soon established itself as the second-largest party but was permanently excluded from national government. The DC was a party of many factions, from the Christian Left to the anticommunist Right, but soon proved unable to win stable majorities. A brief dalliance with the neofascist Italian Social Movement (MSI) in 1960 sparked violent clashes, and for most of the next decade it relied on Socialist or Social Democratic support, including under Aldo Moro’s premiership from late 1963 to summer 1968. The revolt against the MSI, the lack of a transfer of power, and a two-decade economic miracle, created the conditions for rising labor militancy across the 1960s. Even as the PCI reached around 30 percent in national elections, a diverse extra-parliamentary left emerged, critical of that party’s gradualist and top-down approach to political change. The so-called Hot Autumn of 1969 particularly highlighted these contradictions. Following in the wake of the international ’68, this wave of workplace militancy both secured massive wage rises and spurred the rise of a New Left that looked beyond trade union-style corporatism. It was soon combined with movements outside the factories. If in the 1960s migrant workers from Southern Italy became increasingly important to the labor militancy of the North, in the 1970s it was a new feminism that made its mark on the extra-parliamentary groups. But if such movements expressed disquiet at the PCI’s conservatism, this party’s aim was to secure legitimacy at the institutional level. Under DC rule the PCI had long built its strength through workplace and community organizing. Yet the first regional elections in 1970, and Enrico Berlinguer’s rise to the PCI leadership that same year, heralded an institutional breakthrough. He radicalized former leader Palmiro Togliatti’s call for a rapprochement with Catholic Italy, the DC’s base. Though it had earlier origins, Berlinguer’s turn was especially inspired by the events in Chile. Elected in 1970, Salvador Allende’s left-wing government had attempted to drive reform based on a small parliamentary majority. Immediately faced with violent domestic subversion, in September 1973 Allende was crushed by a CIA-backed military coup. In an Italy with its own sharp Cold War dynamics, Berlinguer saw that the PCI could not rule simply by cobbling together a coalition with 51 percent of seats. His historic compromise instead sought to integrate the PCI into a coalition led by the DC. This would prove his party’s commitment to republican institutions while also allowing it to push for reforms. Berlinguer’s opportunity came with the 1976 general election. The DC fell to 38 percent while the PCI rose to 34 percent, the closest it had ever come to first place in a general election. No party had a parliamentary majority, but Berlinguer’s party agreed to back a DC cabinet in the name of “national solidarity,” without being granted any ministerial posts of its own. For Aldo Moro, the pact was possible because the DC and PCI each knew what world they really stood for. He spoke of “parallel convergences” — a transaction in which neither party would lose its identity. Even a leftist PCI “heretic” Pietro Ingrao accepted the pact; and so, too, could DC conservatives see the value in defanging the Communists. In the new parliament the PCI embraced Italy’s NATO membership, further distancing it from Moscow; this, together with its tough stance against negotiations with the Red Brigades, produced moments of trauma within party ranks but conformed to its search for institutional legitimacy. This logic also governed its response to the social movements of 1977. This youth revolt was something of a second Italian ’68 and intensified the opposition between the PCI and the extra-parliamentary left, which now took a less organized form. While the PCI was not uniformly hostile to the movement, even longstanding leaders like Pietro Ingrao were critical of its failure to open up to students’ and young workers’ demands. The movement’s amorphous character owed to the recent dissolution of the larger extra-parliamentary left organizations. But several hundred militants embraced an alternative route: the underground. Fearing state repression after the reflux of the movements of 1977, these circles sought to give a military spark to mass mobilization. Though its activity peaked in 1978–81, Italy’s armed-struggle left had a longer history. It was inspired by guerrilla movements like the Algerian National Liberation Front (FLN) and the Viet Cong, as well as the “Red Resistance” of World War II. Giangiacomo Feltrinelli’s GAP even adopted the — slightly altered — name of the PCI’s wartime military cells. The Resistance had ended with an institutional compromise, as the PCI sought to keep Italy outside the nascent bloc system. This approach rapidly failed, as the end of the wartime alliance brought protracted DC rule and Italy’s entry into NATO. For the armed-struggle left, the solution was to explode the Cold War “spheres of influence” by force. Adopting a Resistance language, groups like the Brigate Rosse, XXII Ottobre, and Prima Linea took the US for an occupier, the Republic for the spearhead of fascism, and Berlinguer’s party for social-fascists. They sought to intensify social struggle and thus explode the cozy coexistence between the PCI and the DC-dominated Republic. The Metropolitan Political Collective founded in Milan in 1969 had initially maintained public activity, through its workers’ circles in the Pirelli, Alfa Romeo, and Magneti Marelli factories. But the fascist terror attack at Piazza Fontana in December that year encouraged this and groups like Feltrinelli’s GAP of the imminent need to take to the underground. This gave rise, in 1970, to the Proletarian Left and soon the Red Brigades. “Armed propaganda” in the factories and early kidnappings brought the arrest or killing of most initial leaders, but in 1976 it was reorganized under Mario Moretti’s leadership. He abandoned the Brigades’ public-facing “mass front” work in favor of spectacular acts of violence. 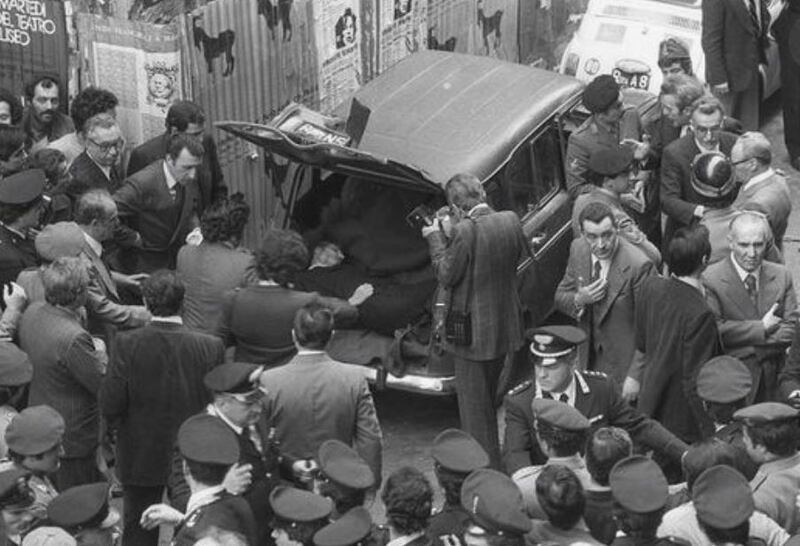 Already in 1974, magistrate Francesco Coco had become a target for the group when he blocked a prisoner exchange between a magistrate held hostage by the Red Brigades and eight members of the XXII Ottobre circle. Moretti sought retribution. On June 8, 1976 he led a group of five men in killing Coco and two members of his security detail. Such a strategy was confined to only small fringes of the extra-parliamentary left. Much larger movements such as Avanguardia Operaia and Lotta Continua recognized the need for armed self-defense against police and fascist violence but they were sharply critical of terrorist actions, which they saw as elitist and counterproductive. Coco was the Red Brigades’ first premeditated killing, helping to publicize the group’s existence. But far more dramatic was the kidnapping of former premier Aldo Moro. On the morning of March 16, 1978, as parliament prepared to vote confidence in Giulio Andreotti’s new DC cabinet, Moretti and his comrades attacked Moro’s convoy, killing five policemen. Shock soon produced reaction. The main trade unions immediately called a general strike to demand Moro’s release, a line also assumed by the DC and PCI. They refused any negotiations that might risk legitimizing the Red Brigades. On April 22 the Pope called for his “unconditional release.” Only the Socialist leadership called for talks on prisoner exchanges. In letters to the outside world, the prisoner expressed his sense of abandonment. The party leaders’ refusal to negotiate with the Red Brigades, and the impossibility of locating Moro, led inexorably to his execution. In subsequent years his widow Eleonora openly accused his DC confrères of using the crisis to dispense with a political rival. The PCI increasingly called on its members to expose Red Brigades activity, rooting them out in the same way they would fascists. On January 24, 1979 the Red Brigades murdered the trade unionist Guido Rossa after he reported one of its militants. This killing of a popular labor movement figure in Genoa further isolated the group. Rossa’s funeral, attended by 250,000 people, showed the wave of condemnation of the Red Brigades. Attending the funeral, President Sandro Pertini asked to speak with the Genoa dockers, and when told that many of them sympathized with the Red Brigades, he replied that this was precisely why he needed to talk with them. The octogenarian Socialist famously told the dockers “It is not the President of the Republic speaking, but comrade Pertini. I knew [the real] red brigades: they fought with me against the fascists, not against democrats. For shame!” The applause for these words expressed not just the workers’ respect for Pertini, but disillusionment with the Red Brigades. The Red Brigades’ action sought to rupture the alliance between the two main parties. Since 1976 the PCI had tolerated Giulio Andreotti’s DC cabinet through the instrument of non sfiducia (abstaining rather than voting no-confidence), but on the day of Moro’s kidnapping it went ahead, as planned, in offering outright support for the government. This was not enough to allow the PCI any ministerial role. Any further advance on this terrain would soon be thwarted by Moro’s kidnapping, which both removed a potential DC ally and emboldened conservatives opposed to a pact. In January 1979 the PCI decided to withdraw from the majority, knowing it had no chance of joining the cabinet. In the previous decade Moro had sought to pacify the Socialists by bringing them into the governing majority, while also excluding the neofascists. His efforts to integrate the PCI died with him. But the PCI’s turn to opposition also came at a time of wider crisis in the labor movement, most notably marked by the defeated FIAT strike in 1980. The postwar Republic granted the PCI a secondary institutional role, but also left an undercurrent of political violence, inherited from the Fascist period. Already in 1948 a far-Right assassination attempt against Palmiro Togliatti sparked armed demonstrations, and the Red Brigades similarly used weapons handed down from the Resistance. Talk of finishing the “incomplete partisan struggle for liberation” was a dangerous myth. If in the war period spectacular armed actions had helped puncture the Nazi-Fascists’ reign of terror, creating a climate of tension, the Red Brigades’ actions brought them into direct confrontation with a mass workers’ party whose popularity they were powerless to explain. For this reason, the Red Brigades little deserve their chic reputation. They followed a path that was sharply condemned by the vast majority of militants and which held the whole Left hostage to its attacks. A handful of devotees murdered even other militants in order to defend the anointed vanguard, sure that the masses would ultimately rally behind it. Whatever the intensity of their clandestine existence, or the violence to which they were subject by police or prison guards, the brigatisti never earned such a following. The blind faith that the masses were ready for revolution, if not for the PCI’s supposed “betrayals,” allowed them to ignore signs that they were failing to stir a popular response, if not in reaction against them. Yet these events also marked the defeat of the Left that had emerged from the Resistance. The PCI had long sought fuller integration into the republican institutions, yet now found itself on the defensive. Buoyed by the rise of new middle-class layers, Bettino Craxi’s Socialists offered an alternative alliance for the DC, and by 1983 he had become premier. The historic compromise of the 1970s promised no more than to integrate the main opposition party into the ruling coalition. It in fact reflected a sometimes-shallow conception of democracy, a permanent coalition in which each interest would be represented. It threatened to extend rather than fully break with a corrupt partitocrazia. As we look at the debris of that order, Berlinguer’s strategy has a curious afterlife. After the inconclusive general election of March 4, there have been calls for a historic compromise 2.0. The Democratic Party (PD), has in recent weeks contemplated an unlikely pact with the amorphous Five Star Movement (M5S), the big winner on election day. Though some commentators suggest the “end of ideologies” eases such a pact, the crisis of political identities mainly warns against this unlikely embrace. The collapse of the PCI, in turn provoking the demise of the Socialists and DC in the early 1990s, produced an unstable party system that reflects the decline of the old class blocs and the fragmentation of Italian public life. As Aldo Moro explained, the historic compromise rested on parties able to make deals because they knew what “worlds” they represented. Such a reality no longer exists. The M5S is eclectic and unsure of its real longevity; the PD’s remaining base is elderly and middle-class; and the Lega’s immediate goal is not government, but to hegemonize the Right. Today’s PD has roots in the PCI and to a lesser extent the DC. But this neoliberal-centrist force approaches the question of compromise from a totally different standpoint to Berlinguer’s party. It is not mounting a steady ascent toward power, but is itself the embodiment of a collapsed establishment, reduced to under 20 percent of the vote. Since March 4, 2018 Italy has faced deadlock and now, perhaps, a second election. The president’s suggested alternative is a stopgap “neutral” government. No exit route is possible even of a type with Berlinguer’s historic compromise. The Republic survived the violence of the 1970s. Yet today’s impasse leaves Italian democracy more enfeebled than ever.